Goddess Pratyangira Devi is a representation of Shiva and Shakthi. Her form and energy is a balance between masculine and feminine energies that signify Ekatvam or coherence within one whole self. She is the mother of moksha and grants liberation from the cycle of life and death. She frees her followers of their karmas and takes form when there is a dire need of balance in the world. There is a dark space that is void within the universal mother, Maha Shakthi and Pratyangira Devi comes from there. There’s a feeling of warmth and mysticism that is devoid of fear, time, limits, gain or loss etc. She shows herself fiercely when witch craft and black magic surface. She appears as a quick and sometimes vicious energy and has a mix of good and evil in her. Her combination of lion and human forms has earned her the name Narasimhika. What’s The Need for Pratyangira Tantra Homa? The day is Kalashtami i.e. June 6, 2018. It’s time to invoke Kaal Bhairav, a manifestation of Lord Shiva who is also the God of Time. Goddess Pratyangira’s energies emanate from Lord Shiva and by invoking her we actually invoke the powers of both deities and therefore receive very powerful blessings of both the deities on the day of Kalashtami. Tantra worship involves offering the mind and body to god as an act of supreme sacrifice and inner detachment so that the divine power, here Goddess Pratangira, descends into the body to purify and transform it. The goddess is encompassed in the seed sound ‘ksham’ that destroys the powers of poison, evil, toxins/cancers besides purifying the body and mind. 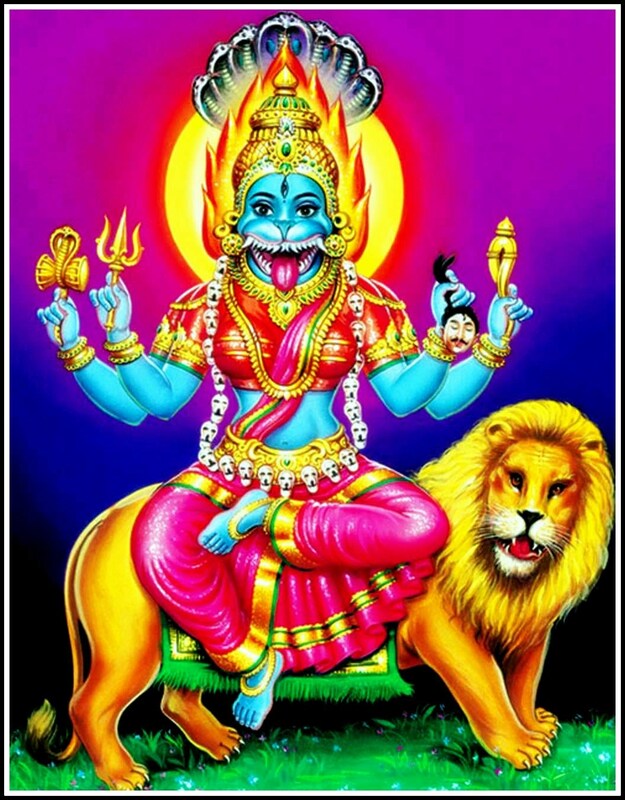 She is also, correlated to Bhairava, and has another adaptation Atharvana Bhadrakali and grants victory to her devotees. So, her invocation on the day of Kalashtami stands justified. She manifested from Lord Sarabeshwara (an avatar of Lord Shiva). The highest form of worship of this powerful goddess is the Sri Chakra. Performing Pratyangira Tantra homa relieves you of pain, diseases and financial problems and also sees that the enemy succumbs to her great powers. One can even get the most wanted sixteen wealth by worshipping the goddess – dexterity, wealth, education, longevity, knowledge, valour, youth, respect, gold, fame, land, intelligence, good progeny, good health, victory and perseverance. The goddess removes obstacles in path and ushers in prosperity to your home. The homa also cures unknown and chronic illnesses, prevents major accidents and removes all mental blocks. There also can’t be a better ritual to get rid of evil eye, witch craft and black magic. Goddess Neela Saraswathi is also known as Tara Devi, one of the Dasa Mahavidyas. She shows devotees the right direction, gives power of speech and knowledge and destroys enemies. The homa also blesses one with sharp memory, intelligence, communication skills. It instils confidence to achieve success. This ritual is highly recommended for students for success in exams, improving confidence and competence. It grants them success in all their endeavours. Kushmanda dwells in the abode of sun god. Therefore her splendour pervades every living being – from most minute vegetation to a gigantic creature. Kushmanda where ku is little, ushma is warmth or energy and anda is egg i.e., little cosmic egg. She has eight arms (ashtabhuja) of which in one she hold a garland that bestows eight siddhis and nine niddhis. Her worship eliminates ailments and sorrows, checks malefic Sun in horoscope and improves fame, lifespan, strength and health. Performing Homa to Goddess Kushmanda brings all success in life. Pray to her with a purified mind and intellect, she grants pleasures and puts one on the path to prosperity. This powerful yantra brings positivity into your life. It is a boon for those seeking material prosperity, facing problems in their tasks, removes evil eye, black magic and negative forces, cuts off nightmares and depression and all negativity. It bestows success, optimism and hope. The yantra gives instant relief from sarpa dosha and nightmares that cause sleeplessness. Worshipping the yantra with devotion and sincerity fetches happiness and peace. Keeping the energised Pratyangira Devi yantra at your place act as shield against negative forces and spreads positive vibrations. Wear this sacred energised amulet filled with sacred ash of the Pratyangira Devi Homam around your neck or wrist with the black string that comes along with it. The amulet wards off all negative forces surrounding you. It also destroys curses, black magic and all forms of evil. This Temple is located in Chennai. This is one of the few temples of Goddess Pratyingara Devi. She is a very powerful goddess who emerged from the third eye of Sarabheswara, a manifestation of Lord Shiva with 1,008 lion heads, 2,016 hands and a blood stained tongue lolling out. A puja in this temple will help for get relief from financial problems, wedding boon, progress in business and employment opportunities.